Diamond Three Stone Rings from Diamonds Chicago. Diamonds Chicago offers Diamond Three Stone Rings and diamond 3 stone rings in Chicago Illinoios. 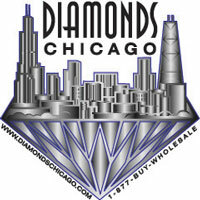 Diamonds Chicago will custom make any three stone diamond ring you like in any carat weight and size you want. 1.00ct total weight princess diamond three stone ring.� Available in 14k white gold, 14k yellow gold and Platinum.� Also available in 3/4ctw.� Click here for more options or to purchase. The elegant looking diamond three stone ring has Emerald cut diamonds and has a total weight of 1.00ct.� Available in 14k white gold, 14k yellow gold or platinum.� It also comes in a variety of different carat weights.� Click Here for your options. This beautiful dimaond three stone ring has round channel set diamonds on either side of the main diamonds. it is avalable in 14k white gold, 14k yellow gold and Platinum. It is also available in 1.00ctw and 1 1/2ctw. Click here for more options. This beautiful Princess dimaond three stone ring has round channel set diamonds on either side of the main diamonds. It is avalable in 14k white gold, 14k yellow gold and Platinum. It is also available in 1 1/2ctw. Click here for more options. 1 carat total weight bezel set round dimaond three stone ring. Comes in 14k white gold, 14k yellow gold or platinum. Also comes in 1 1/4ctw. 3/4 carat total weight dimaond three stone ring with an exquisite antique look. Comes in 14k white gold, 14k yellow gold and platinum. Also comes in 1 ctw.